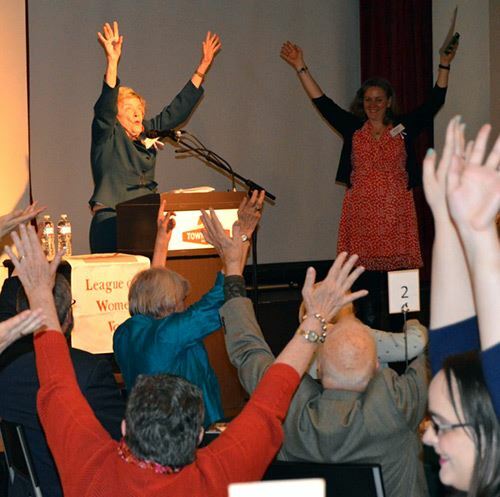 The League of Women Voters, a nonpartisan political organization, encourages the informed and active participation of citizens in government, works to increase understanding of major public policy issues, and influences public policy through education and advocacy. Any person 16 and older may become a voting member of the League. Others may become Associate members. Learn more about what the League does! To become a member, contact your local league directly. If you're not sure which league to contact or there isn't one in your area, you can call, write or e-mail the state office. Otherwise individuals may join as a Washington State Member at Large. Membership dues vary from about $35 to $75. Dues for a second person at the same address are at a reduced rate. Scholarships are sometimes available. No Local League In Your Area? Starting a League can be one of the most rewarding endeavors for individuals and for a community. The formal League structure includes provisional Leagues (new Leagues working toward full recognition as local Leagues), local Leagues, Inter-League Organizations (ILOs), units of members-at-large (members living outside the area of any local League) organized by some local Leagues, state Leagues, and the LWVUS. Learn more about how to form a new league chapter. Learn more about starting a new League. If there is no Local League in your area, you may join the Washington State league directly as a Member at Large.